When you do an inventory of your college dorm room when you first move in, you're going to notice something immediately. There aren't many electrical outlets. You may immediately think that you'll just have to make do, but then another thought will follow - you have to share what electrical outlets you do have with your college dorm roommate. One thing is for sure - there will not be enough electrical outlets for all of your dorm electronics. Add extra electrical outlets to your college dorm room and avoid completely revamping your room to where the outlets are located with our Power Max - 6-Outlet Surge Protector With 2 USB. 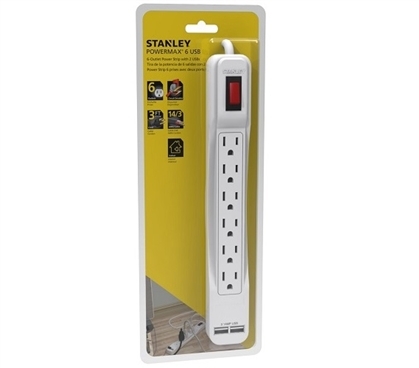 Our Power Max - 6-Outlet Surge Protector With 2 USB has a three foot cord that will allow you some flexibility with where you need to move this dorm item. You may think the best thing about it are all the extra electrical outlets you'll be receiving, however there is more. This must have dorm room gadget is also a surge protector that will protect your valuable dorm electronics. With this dorm necessities item, you don't have to worry about unplugging a dorm electronic item such as your TV to plug in your phone charger to charge your phone. Along the bottom of this dorm essentials item are two USB outlets so you can plug your tablet or smartphone charging cable right into the USB ports. Start college out right with college supplies like our Power Max - 6-Outlet Surge Protector With 2 USB that make college living better.